← Netanyahu: Removal of Jewish settlements is ‘ethnic-cleansing’! 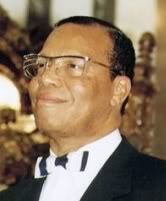 On September 7, 2016, the leader of the Nation of Islam, Louis Farrakhan in a statement praised NFL quarterback of San Francisco 49ers Colin Kaepernick for his fight in the cause of freedom, justice and equality for the Blacks and other non-White minorities in the United States. Colin Kaepernick has brought a fresh political breath into American sports controlled by Zionist Jews. With image of Kaepernick standing at a podium, sporting an Afro the size of a small solar system, adorned in a T-shirt bearing the image of Fidel Castro and Malcolm X, is reminiscent of Nelson Mandela, urging Black South Africans to “fight back” against apartheid’s violence. This entry was posted in General and tagged sports. Bookmark the permalink.